For an industry that’s seen staggering growth and disruption since the launch of the first smartphone, 2017 was the year that mobile app innovation and growth was disrupted. Stalwart industry players held and gained market position, while years-old disruptors struggled to find their footing. 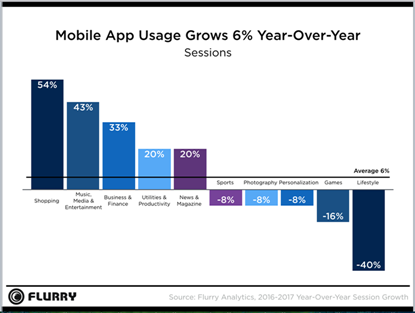 Compared to 2016, Flurry measured overall session app activity growth of just 6%. While growth may have stagnated, users continue to diversify their behavior while using mobile applications. This past year’s 6% growth is down from 11% in 2016. As we reported last year, users now spend more than five hours a day on their smartphones, and shift their daily time spent between new and old app experiences, versus giving more of their overall daily time. Lifestyle saw the steepest decline in growth with -40% in 2017. The decline in Lifestyle, a catchall category for both the Google Play and Apple App stores, highlights an app’s need to build daily usage habits in order to retain or increase year-over-year growth. While Gaming saw another year of decline in sessions with -15% in 2017, Flurry has previously reported that gamers are spending more time and money in mobile games than ever before. Understanding formfactor adoption is critical for both app developers and marketers, as we know that usage differs between devices. 2017 proved that there is no end in sight for phablet growth — they represent a staggering 55% of active devices. 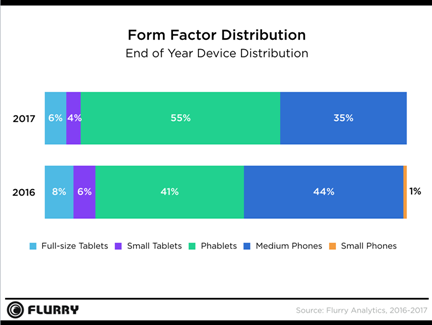 As medium phone users trade in their devices, it is clear that they’re opting for phablet devices, as 9% of the phablet growth came from medium phone adoption decline. Although Android manufacturers make up two thirds of all active devices in 2017, Apple dominates individual market share with 34% of all active devices. Samsung maintained their share between 2016 and 2017 with 28% and will look to return to growth in 2018 with the launch of the S9. 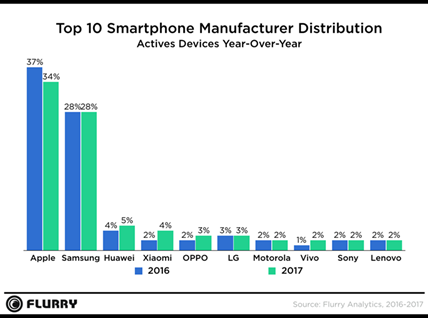 Chinese manufacturers Huawei, Xiaomo, and OPPO round out the top five and are slowly seeing growth by driving adoption in Asia Pacific and European markets. Although session growth may have stalled, it has never been more apparent that mobile apps and smartphones have cemented their roles in users’ lives. While users, marketers and the tech industry drive towards what’s next, developers have an incredibly captive audience and a platform to engage them. 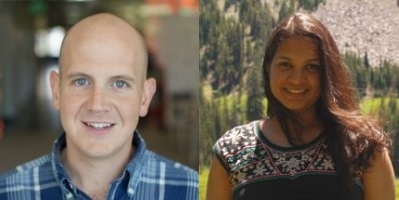 And Flurry will be there to help drive forward the mobile app market forward. Here’s to 2018!